The FALCON. 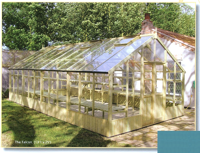 This is an EXTREMELY spacious Wooden greenhouse with double doors and room to store plands "down the middle". Swallow greenhouses come Assembled, with a list of extras as standard. (Toughened Glass, Damp Barriers, Autovents).